Leg lengthening and shortening are types of surgery to treat some people who have legs of unequal lengths. Traditionally, this series of treatments involves several surgeries, a long recovery period, and a number of risks. However, it can add up to 6 inches (15 centimeters) of length to a leg. The surgery is done under general anesthesia. This means the person is asleep and pain-free during surgery. Metal pins or screws are placed through the skin and into the bone. 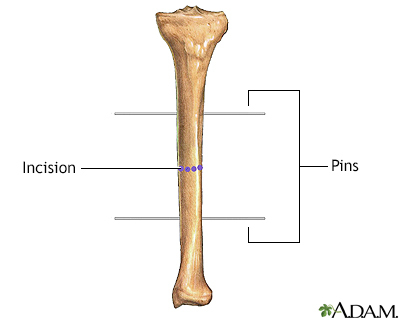 Pins are placed above and below the cut in the bone. Stitches are used to close the wound. A metal device is attached to the pins in the bone. It will be used later to very slowly (over months) pull the cut bone apart. This creates a space between the ends of the cut bone that will fill in with new bone. When the leg has reached the desired length and has healed, another surgery is done to remove the pins. In recent years, several newer techniques have been developed for this procedure. These are based on the traditional leg lengthening surgery, but may be more comfortable or convenient for some people. Ask your surgeon about the different techniques that may be appropriate for you. This is a complex surgery that can produce a very accurate degree of change. The bone to be shortened is cut. A section of bone is removed. The ends of the cut bone will be joined. A metal plate with screws or a nail down the center of the bone is placed across the bone to hold it in place during healing. The surgeon makes a cut over the growth plate at the end of the bone in the longer leg. The growth plate may be destroyed by scraping or drilling it to stop further growth at that growth plate. Metal pins, screws, staples, or plates may be used to hold the bone in place during healing. Most orthopedic surgeons will wait several months to a year before removing any large metal implants. Another surgery is needed to remove the implanted devices. Leg shortening or restricting is considered for smaller differences in leg length (usually less than 5 cm or 2 inches). 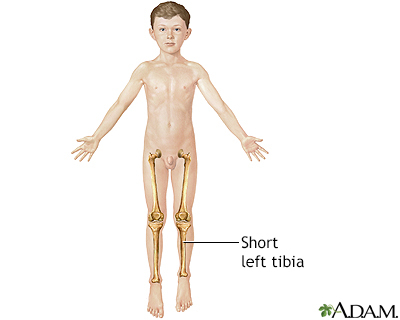 Shortening a longer leg may be recommended for children whose bones are no longer growing. Bone growth restriction is recommended for children whose bones are still growing. It is used to restrict the growth of a longer bone, while the shorter bone continues to grow to match its length. Proper timing of this treatment is important for best results. It is common to spend up to a week in the hospital. Sometimes, a cast is placed on the leg for 3 to 4 weeks. Healing is complete in 8 to 12 weeks. The person can go back to regular activities at this time. It is common for children to spend 2 to 3 weeks in the hospital. Sometimes, a cast is placed on the leg for 3 to 4 weeks. Some people take 6 to 12 weeks to regain normal knee control and function. A metal rod placed inside the bone is removed after 1 year. The person will spend a few days in the hospital. Frequent visits to the health care provider are needed to adjust the lengthening device. The amount of time the lengthening device is used depends on the amount of lengthening needed. Physical therapy is needed to maintain normal range of motion. The amount of time it takes the bone to heal depends on the amount of lengthening. Each centimeter of lengthening takes 36 days of healing. Because the blood vessels, muscles, and skin are involved, it is important to check the skin color, temperature, and sensation of the foot and toes frequently. This will help find any damage to blood vessels, muscles, or nerves as early as possible. Bone growth restriction (epiphysiodesis) is most often successful when it is done at the correct time in the growth period. However, it may cause short stature. Bone shortening may be more exact than bone restriction, but it requires a much longer recovery period. Bone lengthening is completely successful about 4 out of 10 times. It has a much higher rate of complications and need for further surgeries. Joint contractures may occur. Davidson RS. Leg-length discrepancy. In: Kliegman RM, Stanton BF, St. Geme JW, Schor NF, eds. Nelson Textbook of Pediatrics. 20th ed. Philadelphia, PA: Elsevier; 2016:chap 676.